A month ago, we wrote of the Australian education sector’s anticipation of how the new government might approach the international component of the industry, which has weathered substantial declines over the past several years. Now, there are signs of hope that (a) the international education sector, looked at as a whole, is firmly on the path to recovery and (b) the new Coalition government in Australia is committed to strengthening the country’s competitiveness as a leading destination for international students. Australian Education International (AEI) recently released new international enrolment data, reflecting year-to-date (YTD) trends through August 2013. While total international student enrolments went up only slightly YTD August from 2012 to 2013 – by 0.8% (compared to an average year-over-year increase of 5.7% over the preceding 10 years) – commencements were up more significantly: a 7.4% increase YTD from 2012 to 2013. Moreover, this 7.4% compares favourably to the average annual increase of 4.9% over the preceding 10 years. The news is less positive for the Vocational Education (VET) sector, however, which is registering continued international enrolment and commencement declines and is troubled by mixed signals from the government regarding how much it may change policies to help bolster the sector. Across the board, commencements grew at a faster rate than enrolments, possibly signaling a strengthening enrolment trend for Australia going forward. Even the VET sector, which declined both in terms of enrolments and commencements, saw a much more marginal dip in its commencements (-1.9%) than in its enrolments (-8.4%), which could be a sign of a slow turnaround. 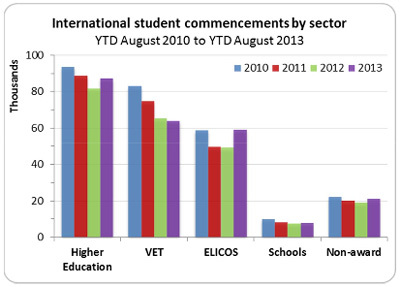 The ELICOS sector accounted for 17.8% of total enrolments and 24.7% of total commencements. China took the lead, accounting for 23.8% of enrolments and 21.5% of commencements. Brazil followed with enrolments at 9.2% and commencements at 9.9%, and then Colombia with 8.2% of enrolments and 8.7% of commencements. The VET sector accounted for 24.8% of total enrolments and 26.8% of total commencements. India had the largest share of total enrolments (21.8%) and of total commencements (16.9%). China accounted for the next largest share of enrolments with 10.6%, followed by the Republic of Korea (7.2%) and Thailand (6.5%). This last point is a huge one for the VET sector as it continues to work to reverse a declining enrolment trend. Under those earlier reforms, which came into effect in July 2012, international graduates of Australian universities were entitled to remain in the country and work for up to four years after graduation. However, the government has yet to extend these same visa provisions to private-sector providers. Some observers have noted the government’s hesitancy to expand post-study work rights for private providers may be due to a concern that this will threaten domestic workers’ jobs in entry-level occupations. This issue persisted around the recent AIEC conference as initial excitement over the Minister’s remarks was tamped down when rumours began to circulate that a significantly reduced number of private providers would be considered for the expanded list of schools eligible for SVP. “The criteria used by the Department of Immigration to ensure the universities had strong track records of visa compliance are publicly available, see page 15 of the Guidelines for University Participation in Streamlined Visa Processing. Additional questions about the government’s plans for post-secondary, and the VET sector in particular, were raised in mid-September when the ministries responsible were restructured. The new Coalition government has wound up the former Department of Industry, Innovation, Climate Change, Science, Research and Tertiary Education, and another ministry – the Department of Education, Employment and Workplace Relations – has been split into two in order to form the new Department of Education and the Department of Employment. Within this new structure, responsibility for higher education has now moved to Minister Pyne’s Department of Education, whereas responsibility for the VET sector transfers to the newly created Department of Industry. Interestingly, responsibility for international education rests with the Department of Education as well. “Providers are scratching their heads over the arrangements, which will force some to deal with four federal portfolios,” observed The Australian recently. “The change raises many questions. Do vocational colleges with international students deal with the department of industry, education, or both? Previously, there were talks of a merger between the two education regulators (the Australian Skills Quality Authority for the vocational sector and the Tertiary Education Quality and Standards Agency for higher education). However, the department changes now make this merger unlikely to go ahead. At the least, the restructuring signals the government’s intention to administer the VET and higher education sectors as distinct streams of education and training. The new structure may help strengthen the role of VET providers in giving innovative skills training to Australians, but for the moment the impact of this new model on the VET sector’s international programmes is anything but clear. This entry was posted in Australia, Australia/Oceania, Higher Education, Immigration, Language Learning, Most Popular, Regions, Vocational, Work Abroad and tagged working holiday visa, study abroad, visa processing, universities with international students, visa application.